When religion hits mainstream newsstands, you can usually count on the art department rummaging around in the Italian High Renaissance stock to fill space. This weeks cover of US News & World Report is no exception and treats readers to a high quality reproduction of Raphael's (Raphaello Sanzio) Sistine Madonna, to match up with a controversial article on The Real Jesus. Inside, the cover article is "illustrated" by Agnolo Bronzino (1503 72), Peter Paul Rubens (1577-1640, Baroque) and the always popular, Pietro Perugino (1445-1523). This is a safe editorial decision. An illustrator who's been dead 500 years isn't likely to cause much controversy. And, it's safe to say that an article, teamed up with irreproachable art, gains credibility by proximity, even though the substance might be hot-button and largely conjectural. So sure, it's a good mix: Classic art and controversial religious editorial content. But at the end of the day, sad and perhaps even wimpy. Had USN decided to hire a living artist, imagine how much more public involvement could have been created - both for USN and the artist themselves. The result would be talking points in the broader media that referenced the core ideas of the article, with contemporary visuals that added to the conversation. Instead, the brass at USN run for cover and we get illustrations by esteemed artists from history, and bold editorial content that simply hides behind them. I better read the article before commenting but at least about the art, I agree with you. It's just one more "let's play it safe" move. The worst is that I see little in terms of changing that direction. It's just getting wimpier and "safer" by the minute. Real controversy is a no-no! I would hate to see an illustration done by a "Safe" contemporary illustrator though, and I'm biting my tongue not to mention any names. But imagine a cover by Itsvan Banyai or Marshall Arisman? Wow! Or The Real Jesus by David Hughes? THAT would give me faith! I used to love to go to Barnes and Noble and look at what interesting covers are being done out there. I still do that, but also see that Barnes and Noble have mined the history of western art for their covers. Do these covers look bad? No. The art is beautiful. What they can't do easily to be too specific. IN an age where art only has to slightly connect to the content, the thread of connection allows for almost any re-use. Prices? You can get a Frederic Lord Leighton much cheaper than a Timothy Patrick O'Brien. However, I can deliver and original piece of art fairly quickly and have that art reflect the writing inside. USN's use of existing art fro a religion story is SO common. TIME and Newsweek do it too. It seems like an easy call, though not too interesting. I hate to beat my own drum in your article but I will say that my recent painting of Beethoven cause a bit of a stir for a small publication. If they had merely had existing images of the composer they might not have gained any traction with the piece. Any new art would have caused the same reaction. You are right Zimm, it's the new art that captures the eye, causes the talk, and is more compelling. Happens all the time, I guess its easier, cheaper and safer to download an image from the wire than to go through the trouble of hiring an illustrator to do it. I guess editorial doesn't feel like Christmas is the best time to be controversial. The masses, keep them informed, happy and in a spending mood during the holidays, not troubled at home afraid to leave the house. Geuss it depends on the publication and who's pushing the big red buttons. At least most of the Italian Ren paintings are pleasing on the eyes. More of an art history lesson than a current modern comentary. All said, is it bad to want to feel safe around this time of year. Do we really want to see Marsall Arisman Nativity on a mass publication cover? What percentage of the public would really want that? Even if it does stir up controversy, all press is good press theory, does everything need to be stirring? I see your point Zimm, totally. I havn't read the article yet but perhaps an edgy story hiding behnd the veil of a safe piece of art was able to grab more readers than if they put a goyaesque nativity made of cattle parts as the lead-in image? Is the idea to get more people to read the article or to respond to the artwork, whatever style it is? I know some feel some styles of illustration work are safe choices. I wonder which illustrators are deemed safe? 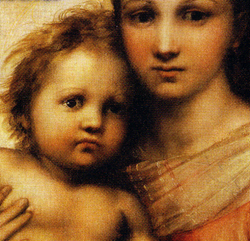 I think the point of this article is that Agnolo Bronzino, Peter Paul Rubens, Pietro Perugino were the safe choices. There are publications where cutting edge work aids the publication, but a cutting edge religious piece of art is NOT the controversy any news-weekly wants to deal with. In the middle american vice of taste and pleasing the advertisers, there still is room to commission great illustration and have it connect to the reader and the text. We are all illustrators and of course we would be thrilled to see a story on religion with an illustration by David Hughes. I would be just as thrilled to see anyone here hired as well. The issue really is: How will editorial print survive? It can survive by offering a unique service that cable TV and broadband surfing can not. Part of that equation is contemporary illustration paired with provocative and inspiring content. Conversation starters. I'm using USN as an example of exactly the opposite approach, but they certainly are not alone in a retreat from forward thinking and basic survival strategies in a changing world. Today, if you want eyeballs and conversation starters then you need to give people a good reason to look and a several ways to start talking. That's not conjecture, that's our world today. Instead of editorial boldness in the face of extinction, we see editorial art departments dismantled or downsized. The talent pool for providing outstanding and thought-provoking images has never been greater. The foresight to use that talent as a strategy for survival and growth is not widely apparent. I believe the web has put print in a "deer in the headlights" defensive posture. There has been significant ad dollar drops in all print magazines and newspapers. A lot of those dollars are permantly lost to the web media. The suits at the corporate print boardrooms are afraid of the change and have taken a very conservative approach to staying alive. God, look at editorial cartooning on op-ed pages. Editors are killing the profession. They don't want any cartoonist to rock the boat out of fear of losing even more readership. I believe, in time, the shake-out between print and web will occur and then you will see the suits, editors, and decision makers waking up and demanding cutting edge stuff to differentiate themselves in the world. I only hope there are enough of us left to fill the demand! I think most publications play it safe on the premise that advertisers don't want to be associated with controversy, and all it takes is a few angry letters to Tide detergent from a righteous and indignant "reader" to shoot down content that might have had a broad audience otherwise; challenging journalism has taken a back seat to business. Photography at least appears to be undisputed fact, and historical imagery is safe by the very nature of its historical status, but illustration is risky because it's individual, contemporary, and full of editorial content. That said, I just did a cover for a national newspaper Sunday magazine that was a portrait of one of the founding figures in Christianity (it hasn't been published yet, so I won't get more detailed here). I may be the"safe" choice, in that my work uses historical devices, but I was chosen for the very reason Tim points out: When an image needs to be tailored to the subject matter at hand, no one does it better we do. Print editorial understands full-well what advertisers want. They want more eyeballs. If conversational art or provocative and informed content delivers more eyeballs, they don't complain and back off, they clamor. If controversial content drove away advertising dollars, South Park would have never made it through season one and The New Yorker would be a distant memory. I'm going to stay on this topic. Tomorrow - Illustration Forward.